Despite equities bouncing to an afternoon high of sp'1876, the VIX managed to hold the mid 20s (intra low 24.61), settling -4% @ 25.20. 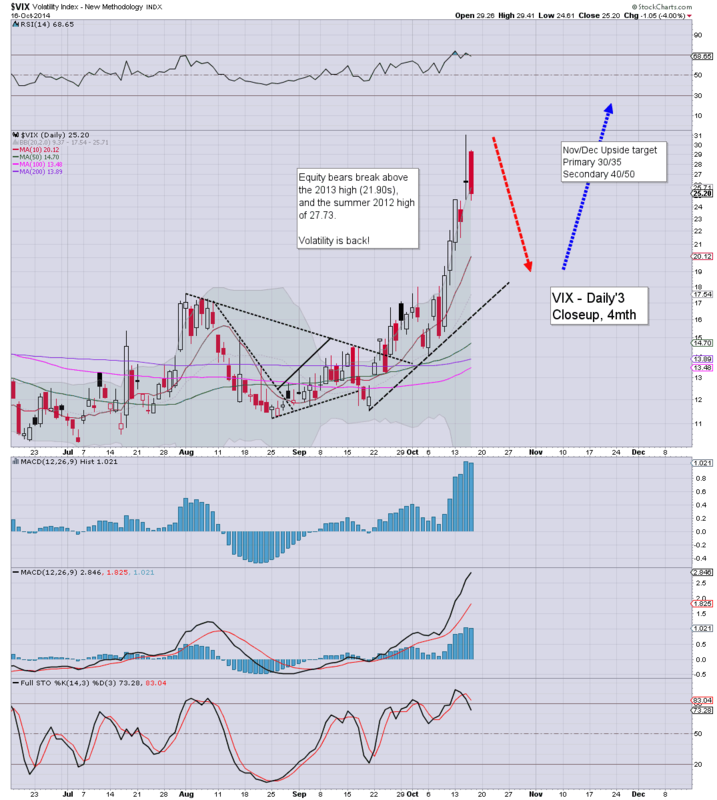 Near term outlook is for renewed equity weakness, and VIX back in the 29/31 zone. 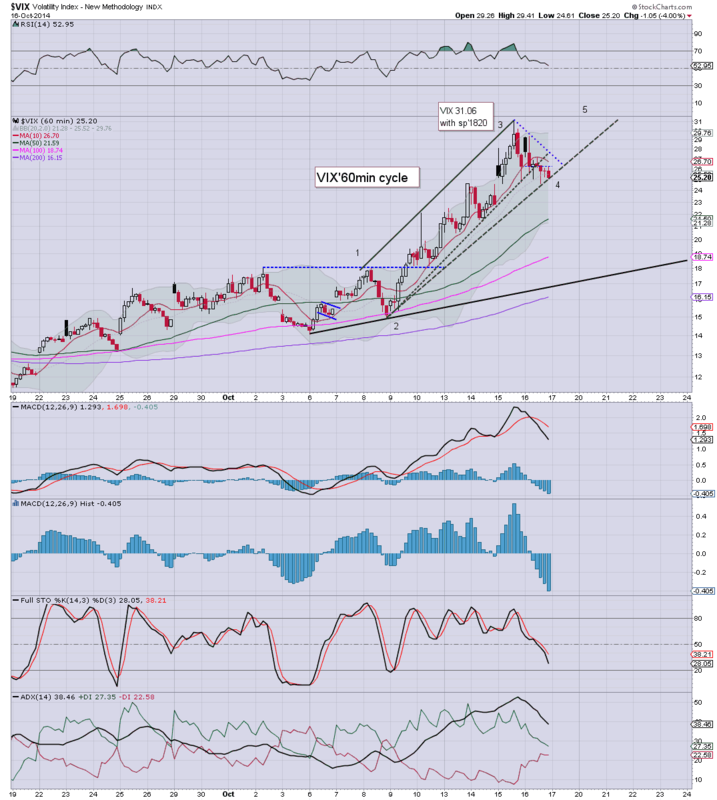 Suffice to say.... VIX looks set for another wave higher.. before probably putting in a short term top....(at least until mid November). If sp'1600s.. then VIX will break into the 40s by late November, a level we've not seen since the major equity drop of Aug-Oct 2011. US equities saw a very mixed day, swinging from pre-market lows of around -40pts @ sp'1822, an early afternoon peak of 1876, and settling u/c @ 1862. The two leaders - Trans/R2K, settled +1.1% and +1.2% respectively. Near term outlook is bearish into the weekend. ... and another wacky day comes to a close in market land. A pretty powerful ramp from those pre-market lows, but.. with a little latter day weakness. A marginal lower low <1820 looks very viable tomorrow.. if not early Monday. 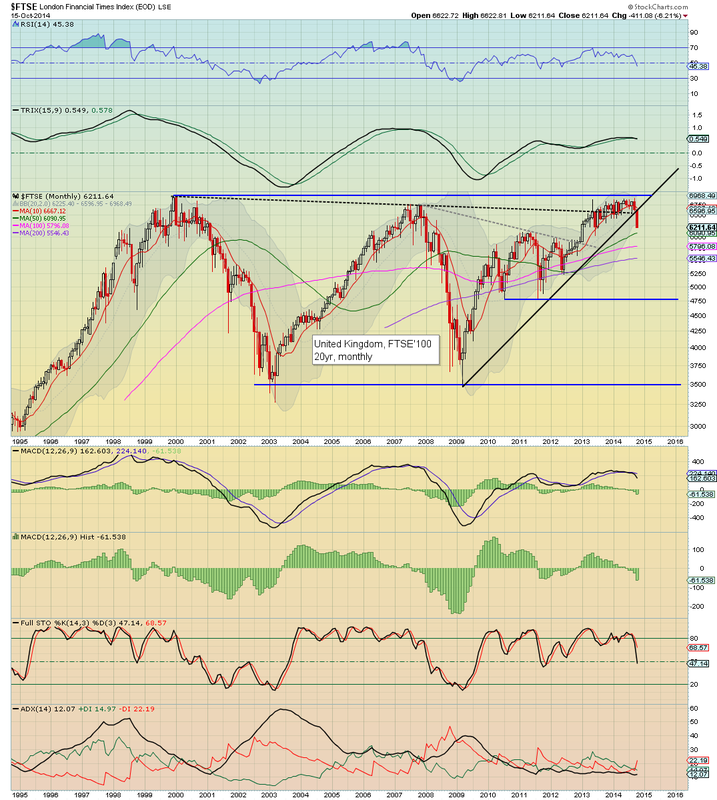 A break back into the low 1900s then looks likely. As I will continue to note, it is at the top of the next multi-day bounce that things get real interesting. *chart 5b, best guess... a marginal new low.. and then.. UP UP UP. A somewhat tedious day... having swung from a pre-market low of around sp'1822 (sp -40pts) to an intra high of 1876. *I will hold short overnight, seeking an exit somewhere under 1830 tomorrow. Trying to get an exit in the 1820/10 zone... won't be so easy. 3.28pm It remains choppy, but underlying pressure remains down. 2pm update - new highs, right? A mere single day of moderate index gains, and many are already starting to call new index highs. It remains the case that bounces are to be expected... and treated as such. Oil is continuing to build gains, +1.7%, from earlier declines of -1.2%. A break much above sp'1875, and the door is open to key resistance in the 1920s, but really, I find that almost impossible to conceive. Personally, I'd like to see a daily close, somewhere in the 1855/45 zone, along with moderate gains in the VIX. That will keep open the door to a more logical key floor in the 1815/00 zone... tomorrow/early Monday. *With the smaller cycles as they are, I picked up a small index-short in the past hour, will look to drop late Friday afternoon. 2,15pm.. smaller cycles are set to turn negative by 3pm or so.... bears should be able to knock the market lower into the close... setting up tomorrow morning. Tedious day... thank the gods for Discovery... with their 'Gold Rush' marathon. Equities remain choppy in the sp'1860/50s, with a VIX that is comfortably holding the mid 20s. 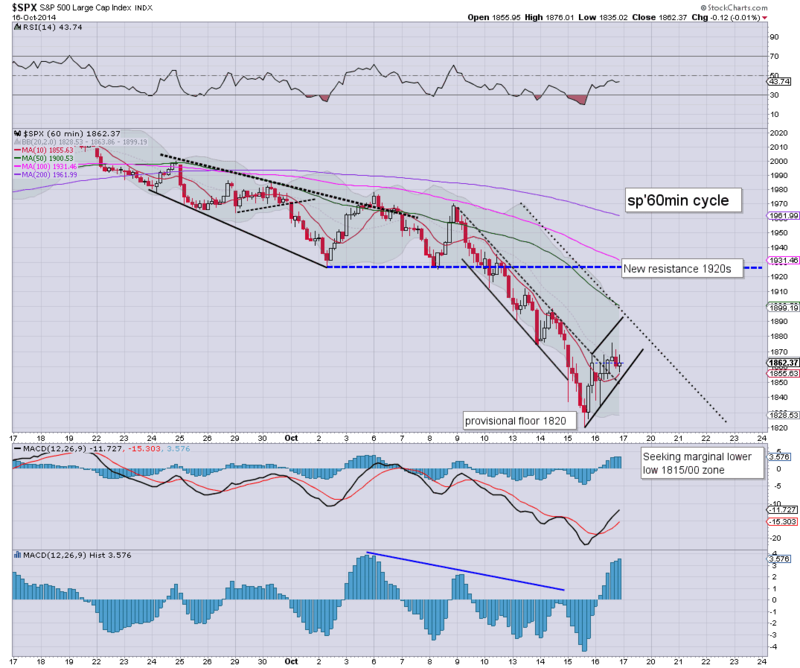 Renewed weakness is highly probable into the close, with follow through early Friday. 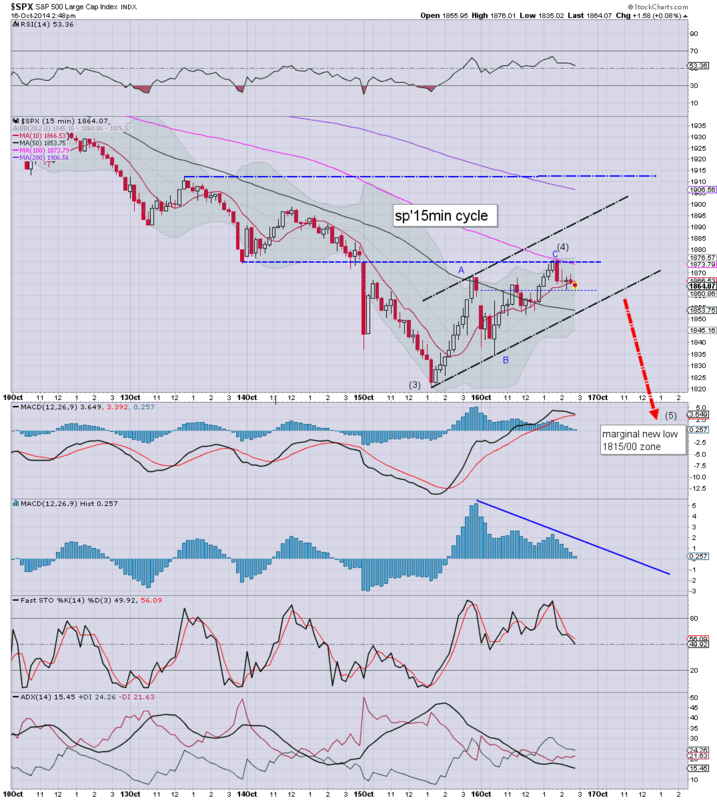 A key cycle low in the 1815/00 zone remains target. Its getting a bit tedious, although the minute by minute swings remain pretty strong. Notable weakness: NFLX, currently holding a daily reversal candle, but there is zero reason why it won't eventually fall to 310/300 zone. 1.19pm.. Picked up a short-index block from sp'1869. Seeking another wave lower.. before this all wraps up. US equity indexes have clawed back almost all of the opening declines, but remain very choppy, and broadly weak. 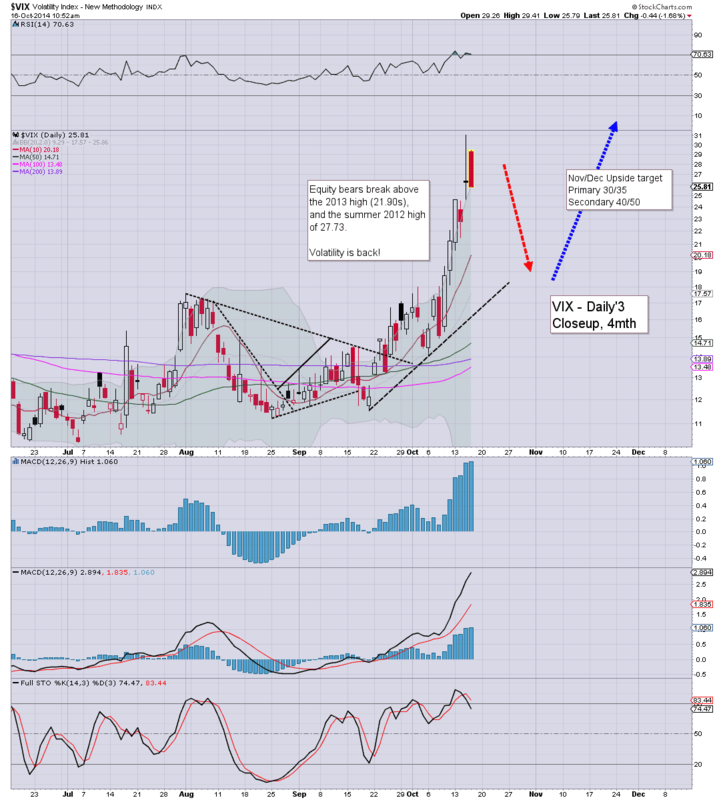 Latter day weakness seems highly probable, with a VIX - currently in the 25s, set to claw back into the low 30s. *the recent wave is arguably a sub'4 ABC 'bounce'... nothing more... with a sub'5... probably down to 1815/00 sometime tomorrow. 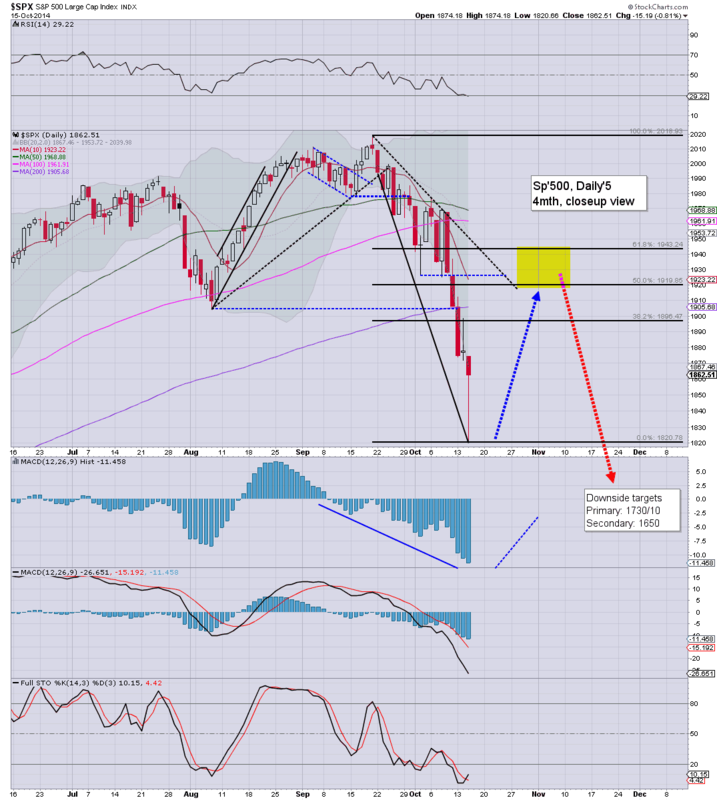 Indeed, I'd look for Friday as a somewhat decisive turn, with net daily gains...maybe a close in the 1830/40s. So, we've even seen the sp' turn briefly higher to a high of 1867, but much like almost every day across the last few weeks, latter day weakness seems likely. Notable gain: CHK, +14%, on an asset sale... although it does little to negate the collapse from the summer. US equities are making a semi-serious play to rebound, with the Trans/R2K already moderately green. Price action remains very choppy though, and a further wave lower still seems highly probable. VIX has cooled from the 29s to 25s. So... a few indexes are already positive, but still, as many recognise, sp'1820 does not make for a particularly solid floor - not least with pre-market futures -40pts. DRYS +9%.. but then..its been cut in half recently. 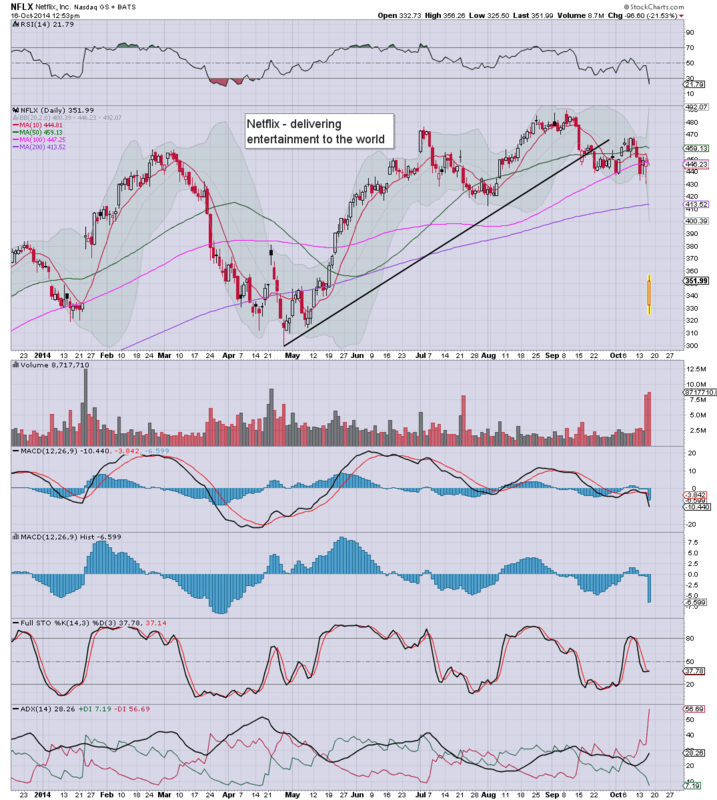 NFLX -20%... still looks headed for the 310/300 zone. Oil remains weak, -0.4%, but well above the lows.. and back in the $80/81s. 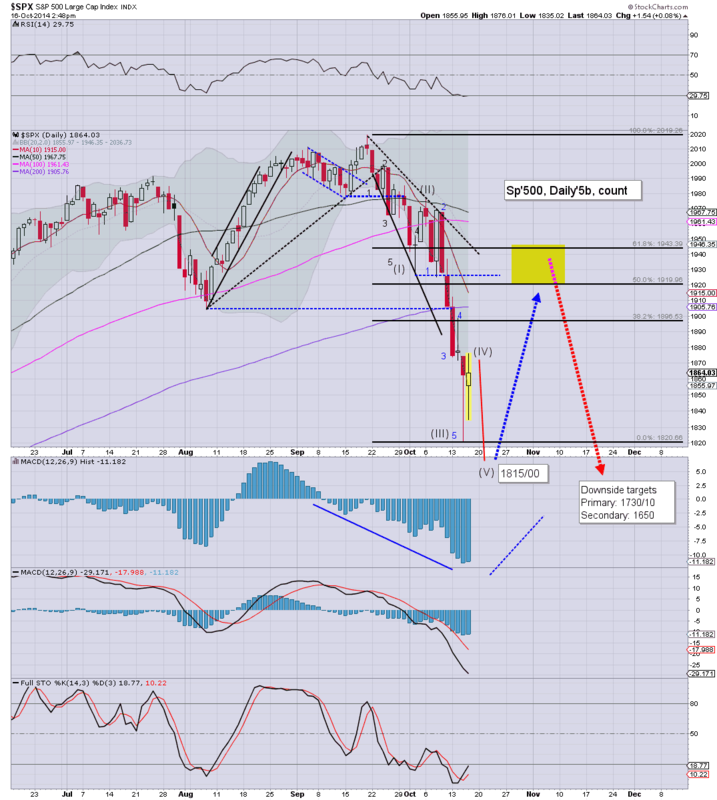 US equities open significantly lower, and there is an opening black-fail candle on the VIX. 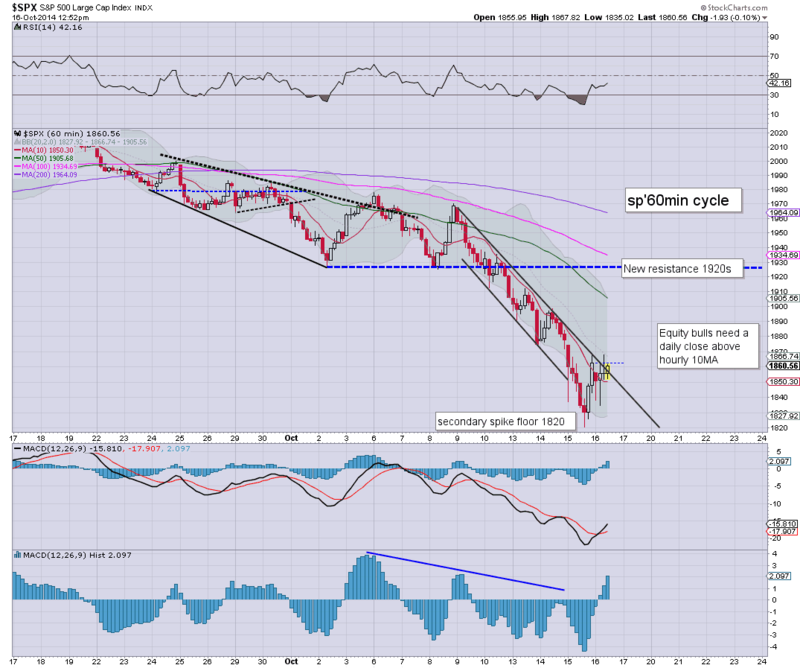 Normally, this would be suggestive a short term floor is in, but... a break <sp'1820 still looks likely. Further equity weakness looks due across today/early Friday. pre-market futures were sp -40pts... 1822.... and the open has been a lot less severe. Regardless of any morning chop, I'm still seeking another break lower.... levelling out in the 1815/00 zone... which might equate to VIX 30/32. If price structure outlook is correct, it'll take until tomorrow morning to briefly break into the 1815/00 zone.. before a key turn. Good morning. Futures are sharply lower, sp -28pts, we're set to open at 1834. Metals are a touch higher, Gold +$2, Oil continues to implode, -1.2%, having lost the $80 threshold. Equity bears look set for another wave lower, breaking <1820, with VIX in the 30s. 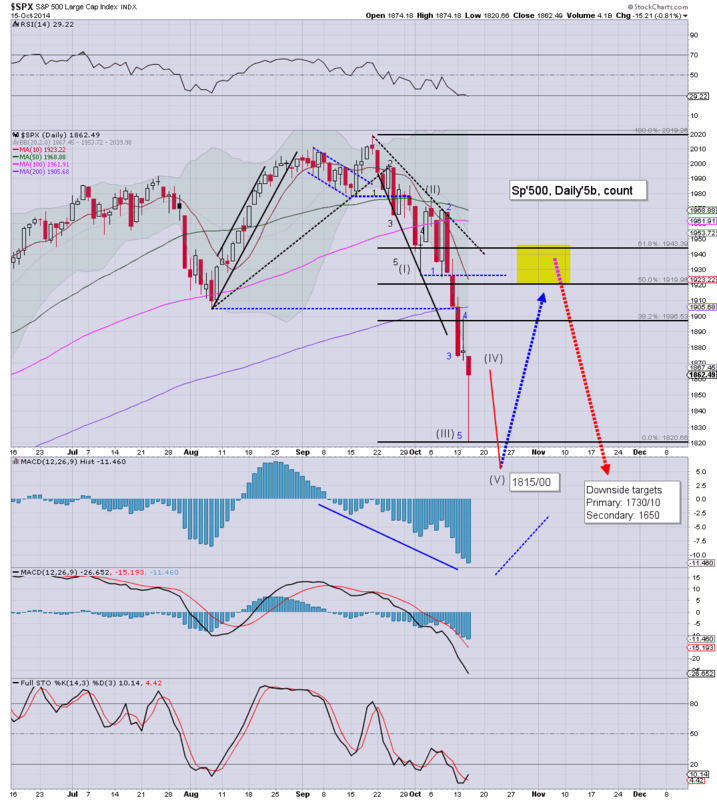 Best guess is the above count, a sub'5th, taking us somewhere to the 1815/00 zone, with VIX in the low 30s. Notable early mover: NFLX, -26% ($116) @ $332, no real support until 310/300 zone. Have a 'fun day'... I guess I could say. 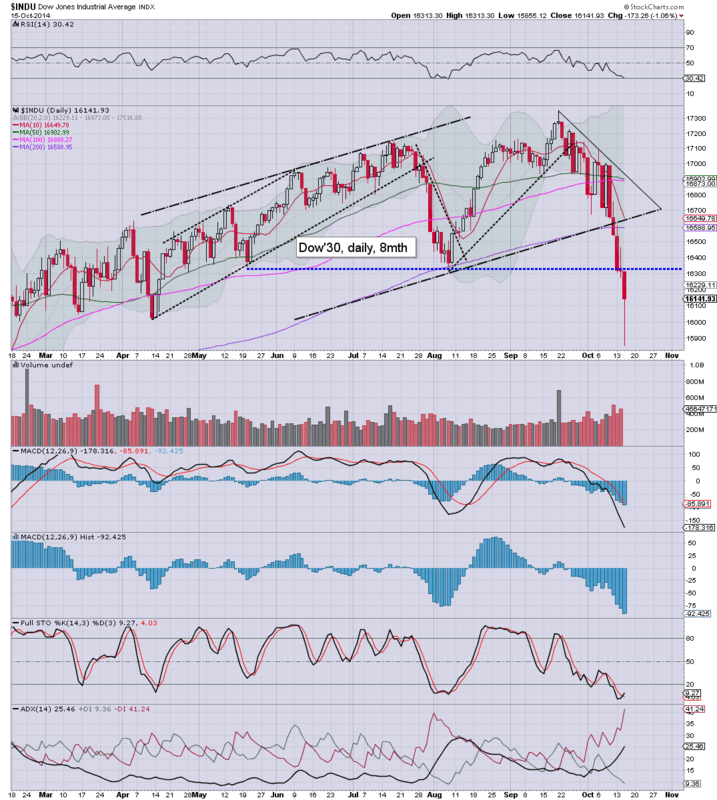 Clown finance TV talking about Dow -120... they are likely.... WRONG. ... right now sp -31pts, we're set to open at 1831. 8.54am.. 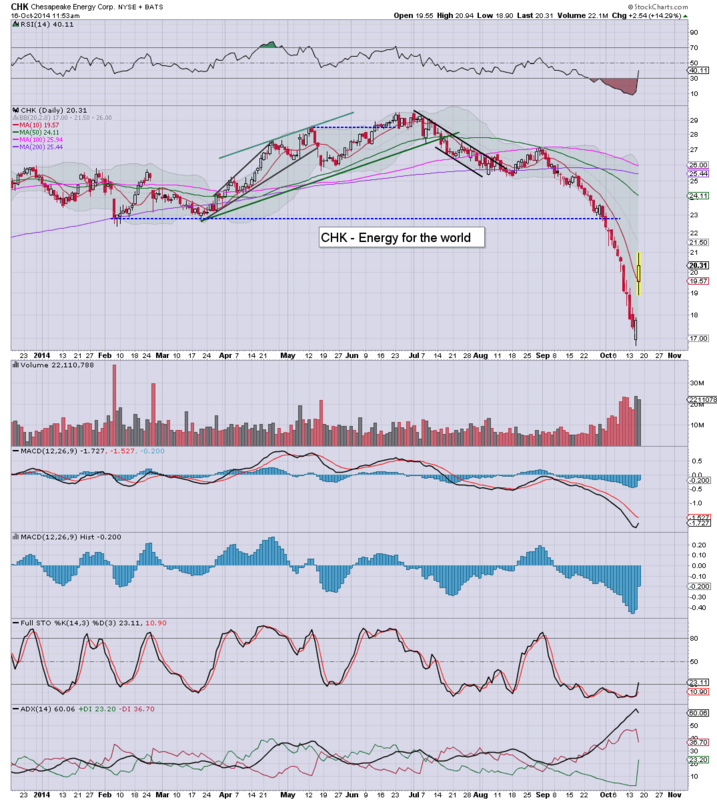 Notable strength: CHK +11%.. on an asset sale of $5bn to SW energy. 9.17am.. sp -28pts, 1934.... its choppy... naturally... but still.. those are strong opening declines.... and yesterdays lows are unlikely to hold. 9.36am.. opening black-fail candle on the VIX, but still, if you assume market will break <1820.. VIX will likely keep pushing higher. With the equity bears breaking a new multi-week low of sp'1820, with VIX in the 31s, the bears are most certainly still in full control. 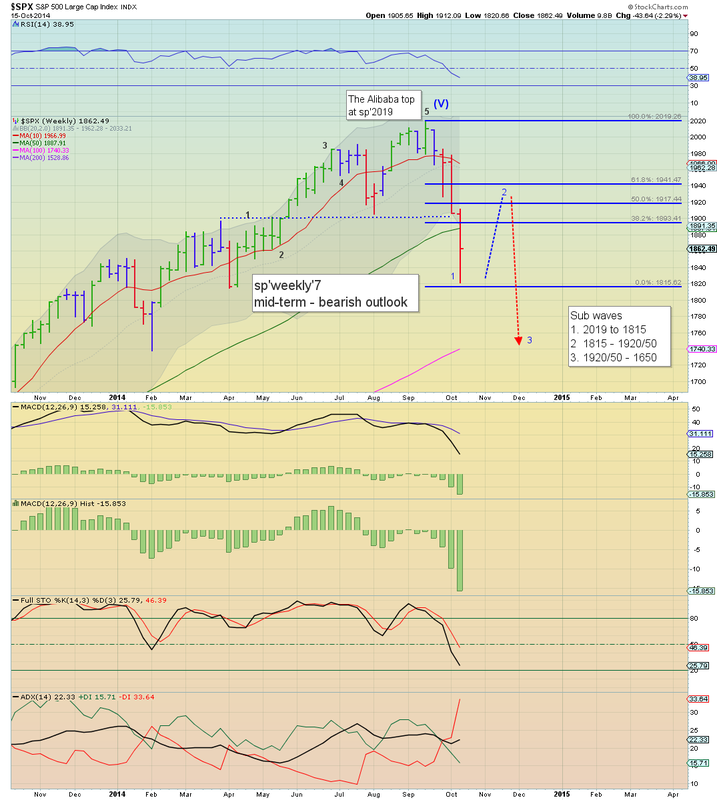 A significant bounce is increasingly likely in the near term, but a bounce... is all it will be. *I'm guessing we will fall a little lower <1820 before the week is done, so, that 1820 floor - with fib retraces, will very likely need to be slightly altered. So.. another fierce down day in market land, as FULLY confirmed in the VIX, breaking the 2012 high (27s), with a new cycle high of 31.06. Just reflect upon the fact that the VIX was in the 11s... a mere four weeks ago. The following remains the primary outlook, it assumes an intermediate top of sp'2019.... the sp'1650s are now the primary target.. the first real opportunity of that level will be mid/late November. 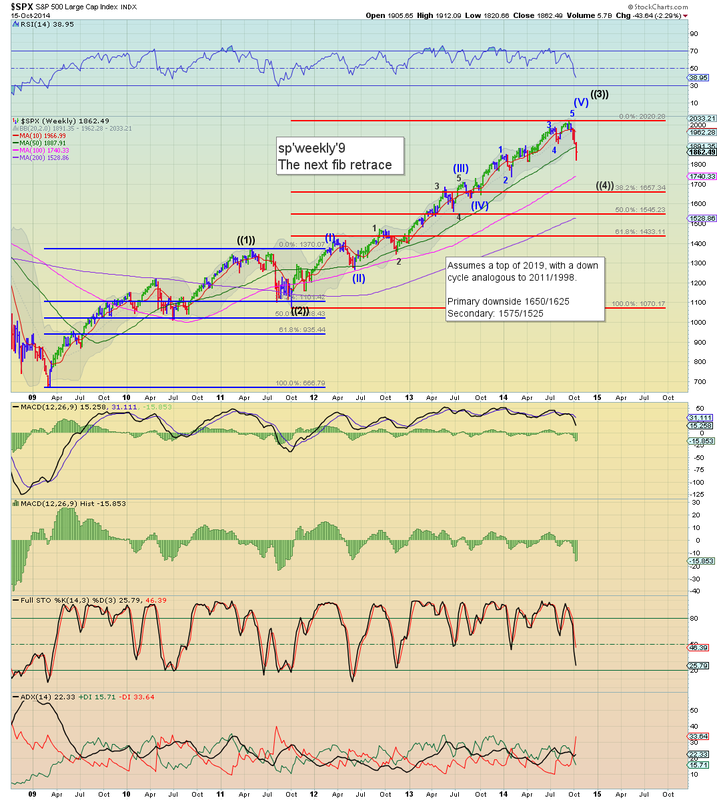 As I noted a few weeks ago, there are serious tremblings in many of the world equity markets. The UK market is also now decisively broken. Regardless of any bounce into late Oct/early November, the FTSE looks set for 5500/5250. A very busy Thursday... with no less than FIVE fed officials due to speak. Econ-data - jobs, indust' prod', phil fed', housing market. *there is very minor QE of around $0.25bn or so. For you regular readers out there, Oscar Carboni is someone you know I regularly highlight. One of his big phrases is 'Do NOT fall in love with the downside'. Indeed, that has been a correct trading approach since 2009. With the monthly cycles now utterly broken, its time for even Mr C' to file for divorce from the bull.. or at least a temporary separation until spring 2015. US equities saw another wave of significant declines, sp -15pts @ 1862 (range 1869/20). The two leaders - Trans/R2K, settled higher by 0.2% and 1.1% respectively. 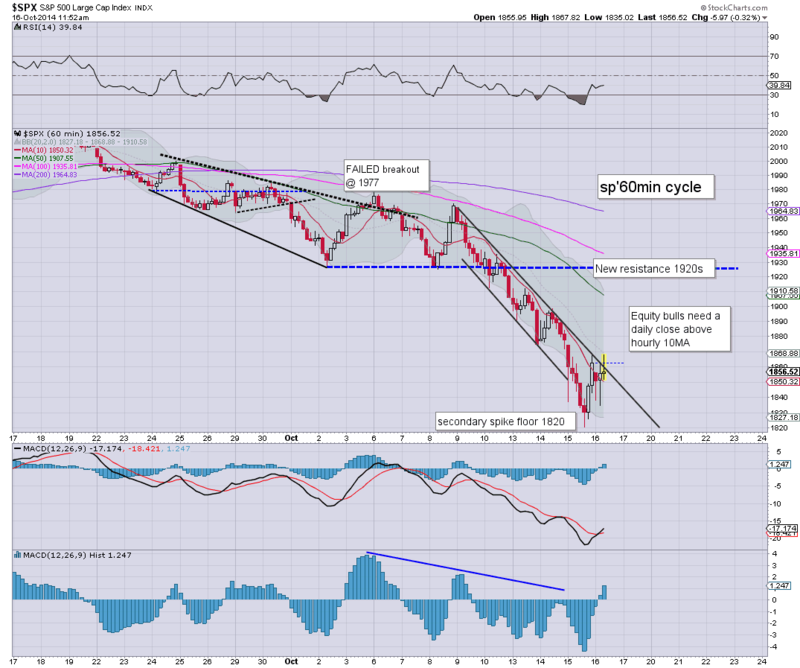 Near term offers a further break lower to 1815/00 zone, before a sig' rebound into early November. Suffice to say, the rather huge intraday declines of around -2.5% were something for the bears to justifiably get excited about. Despite the latter day rebound, with new multi-week lows for equities - FULLY confirmed with a VIX breaking a new multi-year high of 31.06, the market remains in a down trend. There looks to be further viable downside to the 1815/00 zone tomorrow/Friday... before a key turn occurs.